Parent of a depressed teen? Start here! The only way you can help your teen out of depression is to understand what they are going through. Helping is impossible if you don’t know the full story of what they are dealing with what’s likely causing their depression. Knowledge is key and it’s the first step. You need to learn about depression, but also, teen depression specifically. It’s a bit different. In short, here’s the biggest difference between a teen who is suffering and an adult: Most teens are dealing with challenges they are having difficulty overcoming and managing that are causing them extreme stress, AND/OR they have not learned healthy stress-coping skills. If you think back to when you were a teen you will likely be able relate to your teens struggles. The transition between childhood and adulthood is challenging for most people. During the teenager years, we all have to learn how to be responsible. Life becomes much more complex. It can be confusing for many. In terms of depression at this stage of life there are some positives. Because your teen likely just needs help learning how to deal life challenges, and in some cases, simply needs some direction on actions to take to minimize stress so they can feel better. However, the negative aspect of depression with teens comes down to how little they learn to communicate and “vent” about what they are going through. And when they don’t communicate because they don’t feel comfortable, they harbor pain and it can lead to dealing with tough emotions in unhealthy ways. This can lead to accidents, which is how most teens end their lives. They suffer in silence and when the pain is too much they look for a way out. So, the second step in the process of helping a teen overcome depression is for parents to strengthen their own communication skills so that they can be someone their teen feels comfortable confiding in, or that they can help their teen find someone they can talk to if there are certain subjects they aren’t ready to discuss. Educate yourself about depression and teen depression. Start by continuing to read this page. Download the Depression Recovery Map and watch the mini course about it. Strengthen your communication with your teen. Depending on where it is now you may need to resolve upsets and learn new skills yourself. There are videos, articles and course available on this site. If your teen is in crisis they need to see a medical professional immediately. Any teen with depressive symptoms that last for more than two weeks needs to be taken to a doctor for diagnosis in conjunction with support from a parent. You can start here, with step one, learn about depression specifically first before you do anything else. The map and video below will help you get a sense of what your teen is struggling with. Here’s an explanation of the map, the pdf is available below. Depression becomes much more simply to understand when you look at it as a disorder that occurs when a system gets out of balance and malfunctions. There are many ways that can happen but it can all be consolidated to a malfunction in one or more of three variables. That’s what you learn from this map. There are only three ways to defeat depression. Repair any issues that causing a brain chemical imbalance. Repair any areas of life where you are struggling and under extreme stress. Repair any negative behavioral patterns that don’t serve you. 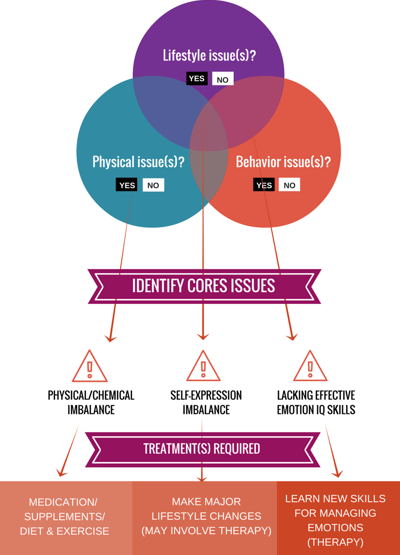 This is a general map that applies to anyone with depression, including teens. Keep in mind that variables 2 and 3 of the map are more commonly the issues out of sync in teens. Common, now. That’s a bit vague. And, it will likely get worse if you do nothing to get it whatever is not working back in working order. 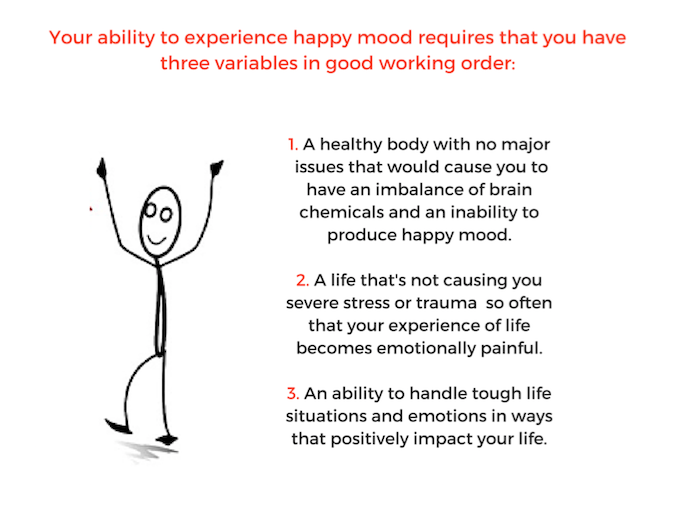 So it’s crucial you evaluate all three of these aspects of you’re life to understand what possible weaknesses could lead to breakdown. Depression is a complex illness because there are many ways each one of the three variables can go from healthy and in working order to malfunction. The key to reversing, solving and managing depression is to identify what’s caused the malfunction by taking an inventory of all the variables that lead to a health crisis. It’s one thing to understand you have a physical brain chemical issue, but what’s most important and overlooked is what caused the it in the first place. Is a lack of nutrition? Could it be a lack of sleep in your routine? Perhaps, you have an underlying medical issue you didn’t know about. It’s important to look at the sources of breakdown because they will dictate your course of effective treatment to get you feeling better fast and allow you to eradicate that issue altogether and save you issue in future. If you live anywhere in North America, we live in nation that takes treatment-first approach to health. The problem is when you treat the symptoms for depression and don’t get to what caused it those behaviors continue and often the person gets sick again. It’s important you do this work. It may shock you to know that 90% of people diagnosed with depression are incorrectly diagnosed and do not need medication. Many can make changes to their lifestyle or learn new behavior skills and will start to feel better very quickly. Sure, you could jump into some type of treatment without doing the work to understand what the real problem is. Sometimes that works. But sometimes there a major negative impacts. And when anything is negative with regards to your health, it’s not worth it. So take a little time before treatment to try and understand what’s wrong. You likely get some insights on ways to act. When you know what’s caused the malfunction it will open up new actions you can take to get to feeling better and restoring your health. And, taking actions after doing some discovery work will increase your ability to make smart choices that will lead to effective and speedy recovery. Learning what you need to do to get better and put in place to prevent future depression can take some time but when you learn skills like – how to eat well and still indulge, how to incorporate daily fitness, how to communicate during tough situations – you’ll be more mentally fit than most people. The entire map and recovery are designed to get you “unstuck”, and to reveal to you the actions you need to take now to get better as quick as possible. Wherever you are in your journey with depression, the Depression Recovery Map is a great place to start. If you’ve been struggling for a long time you may learn something new that will completely alter your approach. If you’re experiencing symptoms for the first time it will direct on what to do about it. Download your free Depression Recovery Map and watch the accompanying video for free.